In the past few years I – and not only me – can see a consistent change of rules. New „technology“ led to new rules that balance a disadvantage of the latest new toy. Additional to that no federation or association took the effort to really standardize the rules and regulations. This “rules” show truly why our sport is still not professional. It might sound weird or abstract but what would Nadal and his companions say if the court was smaller, sometimes wider and sometimes the net is also a little lower? What would Michael Phelps have said if the lane was shorter in Santa Barbara and longer in Germany? Of course, in golf the players have to handle stuff like this all the time. But we don't play golf. We also don't swim and we also don't hold a racket – we play pool! The difference between playing a game and execute a sport is the professionalism of the management. We are in the unfavorable position to be dependent on the pool halls and their owners. On the other hand the World Championships, European Championships and other international tournaments are played in malls and convention halls. In my point of view it is 100% necessary that we all, every player around the world, is aware of the ! exact ! regulations and specifications of a table or at least can access the documents easily. In a sport where Millimeters count it is not enough to set regulations almost in Centimeters. Let's hope we at least don't have to play on red cloth! In 2009 I made a trip to Florida. A friend and me took a car and visited some pool halls and tournaments. At home 10-ball ran over the “old” 9-ball a few months ago and so it was kind of a bummer that the first tournament in Ft. Pierce would be a 9-ball. But well, we were still excited and determined. The tournament was run by Tony Crosby and his wife and everything was well organized. The kitchen was good and the owner was very polite. The only mistake: Diamond tables. I know that some of you now might agree, other don't. But for Europeans the rails of the Diamond are way different to what we are used to. I even think we don't have more than a hand full of Diamonds all in all. I don't want to judge the quality of the product, I just want to mention the big difference of used materials. After the tournament I found somebody to play a cheap set after I already lost some with the other guy before. But well, we all wanna win ;). After a few racks my opponent was aiming a shot on which he could have made both, the 2 and the 10 ball. He missed both. So I kindly asked him to call the shot next time if it's not obvious which one he is going for. His reaction was amazing: why? I explained him that 10-ball is a call shot game and thought that was known. But him and everybody around didn't know what I was talking about. “We don't play call shots!”. I never thought that during the last few months, a 10-ball World Championships was already in the books, Americans and Europeans played a different game. Same same but different! The jewel of the whole trip, the Mezz Classics in Orlando was still waiting. After the SE tour stop at Capone's it was next on the list. My friend had a flu and stayed at the motel but I was curious and headed to the location where we gonna “fight” next few days, the arena. And suddenly I realize where I am. A pool hall that has seen better days. An owner that really tries to be a good host. But to play in a tiny pool room on 3 different tables with totally different rails and pockets was not on my list. Every game was a surprise. The spectators were truly a very positive point. what happens with the 8-ball going on the break? Do we really know the rules? I think most do. Although I have to mention that most rules can change in a 50miles radius. It is important that a sport, that somehow tries to be one, has exact and world wide effective standardized rules. Tournaments must be played the same way all over the planet. It is the WPA's duty to realize this rule book latest by 2012. For almost a decade new rules come up like mushrooms out of the ground. It all started with the tap mat. Suddenly we could rack faster and tighter – which is a funny word. Tournaments saw less arguing and ended earlier. It was a perfect for the referees on the TV table too. But did it really help? Did it really support the sport? I don't think so. After the EPBF/IBP already had to change rules due to the new way of racking and Ronato Alcano won the World Championships in a remarkable way not using his break cue it was obvious – something had to be done. In Europe the alternate break, once 3 breaks each interval, was the solution to avoid having too many players running out whole sets. But what Alcano was in Manila was Stephan Cohen in Prague. He finished 3rd in the Euro Tour without breaking more than 3 balls to or only close to a rail. The new “kitchen”-rule was born. From now on it was common on the tour that at least 3 balls have to cross the kitchen line (break box) while every ball on the break counts as such. The side effect of a hard break was not yet known by then. It occurred that a hard break led to direct the balls to the edge of the side pockets which made them going back down table. Like this even a hard break can be judged as “illegal”. A new “trick” was also to spot the 9-ball on the spot and pull the 1 up table. Wow! Where will this take us? equal distance of 420mm each rail. markers meaning the cue ball is in the middle. Are you kidding me? I heard of the break box and I liked the video tape with Efren and Jimmy Wetch playing it. But “9-ball inside” and “10-ball outside”? The first moment I got in touch with the tap mat and its impact I did not like it! It was obvious that this brings the levels closer to each other. By dawn new break styles and tricks where found. The game, in my point of view, disgraced! The tap mat was recently followed by the magic rack. Not better than its “father”. The WPA and every other federation or association failed to specify clearly if this is an official rack. Also, when the “rack” has to be off the table or what the rule is when a ball is on the “rack” after the break? Many question and nobody that answers. The other side effect, as already mentioned in a previous line, is the close up of the levels. When I started to play pool Francisco Bustamante and Oliver Ortmann with their hard breaks were favorites. It was astonishing how hard and at the same time controlled their opening shot was and still is. You could compare them with Andy Roddick and John Isner. But what if Roddicks and Isners serve is not as important anymore? What if the perfect 1st serve is hit with around 85mph? Would the same tennis players dominate the circuit? Every pool player can give the answer to that question! The hard 9-ball break – history. The hard 10-ball break – not required. And even straight pool got struck by the tap mat. One of the historical games, still loved by many players, has lost its spirit. No key balls, no break shots, no smart patterns – all gone! Fact is that a new “rack” led to multiple new rules and the games' philosophy changed. Germany is known for their road signs huddle. This caused a few towns and cities to re-think. They now took down a high percentage of the signs because the drivers couldn't get along with that many rules to follow. Even worse, accidents resulted from the confusions. It is very important to “take down” some rules here – in a smart way. To make it more clear for the players but, equally as important, for the spectators and fans-to-be. I already think that the “push-out” rule is tough to explain to a new crowd but how are we supposed to explain the “9-ball inside” and “10-ball outside”? I sometimes hear people saying: “well, it's the same for both players”. This is a very interesting quote. Does it help the Red Wings' defense if the goal was double-sized? Does it help the Lakers if the 3 point shot is a 99%-shot? When your defense can not prove itself and your offense can just not be more effective than your opponent's it is a different game. Pros, semipros and amateurs get closer, from one day to the next. It is very important that the federations and the associations take the lead, most of all the WPA. I know that the WPA didn't get too many flowers in my last article. But I can't change the fact that it is the WPA's duty to exactly do what I am asking here. It must be the leader of the sport and show us the directions, rules and regulations. Not less important it is to create a players organization, on the continents and also for the world wide pool. While the players have to learn to think more professional the federations and associations have to start listening to the players and especially the pros. Of course every player is as important as the other but the pros just visit more tournaments, spend usually more time in pool halls and just all their life is about pool. All I am saying is that the organizations have to cooperate with the players way better than they do now. All the Souquets, Van Boenings, Archers and Bustamantes can be very helpful to find solutions. For this article I want to start a few years ago, in the 90's when I started to play pool to be precise. In 1996 I attended the Youth European Championships for the first time although I wasn't really on the level to really compete yet. I did (mostly) what I was told by my coach and my national federation. Growing as a junior player I had more to do with the federation and its elected principals. It didn't take long to realize that not everything is in order. I was definitely not happy with the situation back then and was even part of a committee that tried to dispossess the national governing body of pool billiard. But I thought by myself: this is Switzerland. Once I am a pro I won't have to deal with stuff like that anymore. In 2004 I started to play for a German team in the 3rd division of the German League system. Germany is well known in the pool world, not only for its World Champions but also for the huge amount high-level players, especially in straight pool. In fact this was always a dream of mine since I read about the league in pool magazines. And guess what, I even teamed up with one of these World Champions! We had a fun season, raising in the 2nd division without a doubt. Everything seemed to be just fine. But then, one year later, unbeaten in the 2nd division we had to play the play-offs to get into the premier division. And that's exactly when the fun part started to collapse. Yet again the federation decided to change rules for just unreal reasons. And this never ended. While we still won that play-off and finished in the top3 every year of the premier league after that, winning it in 2009, the German federation never seemed shy of unreal, unnecessary and stupid solutions, officially intending to do good for the sport. At the same time I was playing several European Championships. And what shall I say?! Also the European federation is not above reproach. Many things, in my and also other players' point of view went wrong and a lot of, in my understanding, natural goals were not reached. My biggest disappointment for example was what I gained from finishing 2nd in the EC 9-ball in 2006: a spot at the BCA Open in Las Vegas. To mention, I had to pay the flight, hotel and the 500$ entry fee myself! That is what you get as “first loser”. All of these federations know about my opinion because I was never shy to say it. And all this time I thought: once I am a pro all this won't bother me anymore because I won't have to deal with it beyond a certain point. I was wrong! My first appearance at a World Championship was in Taiwan in 2004. The event was managed and run by Matchroom Sport since 1999 when they herald the new-age of pool events in Cardiff, Wales. Besides my performance the event was a total success! Players knew the deal, promotional clips were already running in the national and continental TV when we arrived at the hotel and the queue in front of the WTC convention hall was about 200 people strong. And also important – I felt like a pro! But this all changed, starting in the very same year 2004. The World 8-ball Championships were given to Fujairah, a city just 90 minutes away from Dubai. Lots of people/players thought that this was promising considering the latest upraising of the emirates. Although the total purse was way too small for such an event most international top players made their way to the desert. I also took part in the 2005 event. And this time it was the other way around. Besides my performance, everything else was ridiculous. We played in a tent somewhere in the back of the hotels, off of everything, with referees that didn't know anything about pool, a time management that made me playing 5 hours late to play for a seat in the elimination round at 3.30am and even an official WC banner over an entrance telling us that we are still in 2004. Well, could you really call this tournament that? To be honest, it's one of the worst events I have played in for a long time! I hate to say that because the UAE people are great and I wish the tournament was a big success, but in truth, the organisation was well below par, and the format was terrible. The referees were terrible apart from the odd one, and to be honest ALL the players said the same. I had what was probably the toughest group, every player in the group was capable of beating the others in the group. But I played some solid stuff and came through on the winners side by beating firstly Joven Bustamante and then Francisco Bustamante, both by a score line of 7-6. Because of the strange format that they decided to use, there were 56 qualifiers for the straight KO stage, but they decided to give 8 byes to the 8players who had lost the least racks in the group stages....all this meant was that the players who had easy groups got rewarded for it, and players who had tough groups like myself were penalised because it was so hard to win heavily against world class players! So I drew Vilmos Foldes in the last 56 and had 4 dry breaks from my first 4breaks! I was 7-1 down and got it back to 7-5, but made the mistake of asking the ref to remove the breaking template (magic rack)....he mark the 2 balls that were near the rack but then proceeded to drop one and moved the marker on the other! This messed the whole layout up of the balls. This eventually hindered me in running the balls out and I lost the rack, and eventually lost 9-6. That means that 27 of the 112 players are either wildcards or qualifiers. I think there are more than enough players around the world that would have earned their spot more than many of these 27 players! My assumption is that there was "a deal" made or the organizer just was authorized to do what he wants. Another funny fact is the system they used this year. Daryl describes already most of it. Which promoter would do a tournament with 14! groups? In 2008 the WPA decided to give the World 10-Ball Championships to Raya Sports of the Philippines, run by Yen Makabenta. Matchroom Sport was kept outside. And it was a disaster! The main squad of Philippine players boycotted the event due to a reigning fight between the Federation, run by Yen Makabenta, and the other stall which promotes the players such as Reyes, Bustamante, Gomez, Orcullo etc.. Spectators didn't arrive, I never received an informational email about the opening ceremony or the opening dinner. Just by accident me and my room mate found out about these happenings just 30 minutes after the first and 30 minutes before the second event. The referees were not trained well! During two of my friends' matches the referee called a foul although everything was 100% okay. During one of my games I had to ask the referee to switch off his cell phone three times in a 3 minutes interval after it didn't stop ringing. Only when I got a little offensive he finally agreed to turn it off. Additionally, players had to wait for their prize money somewhere between 3 and 11 months! You might think now that Ian Anderson and the WPA would not sanction the event again if organized by Raya Sports in the following year?! Wrong! Same old same old in the following year and even worse! In 2009 the Qatar Snooker and Billiards Federation organized the Qatar Open for the first time. All players were looking forward to a new event, held by an ambitious federation. The hotel was nice, the venue was convenient and the people very nice and courteous. The only mistakes they did is the choice of tournament directors. Their biggest mistake was the draw! You would think that the head of our sport would know how to do a draw but again – wrong! While I played and lost against Darren Appleton, Marcus Chamat beat Yi-Ko Pin. So Yi-Ko Pin and me both won the following match in the loser round and then... guess what: we played the same players again. Darren and Marcus lost their next match and were sent “west” where the exact same players were waiting that they just beat the match before. Not conform with the situation I knocked on the tournament directors office a few hours before the upcoming matches to call their attention on this circumstance. After a internal meeting of the tournament director and Ian Anderson himself they told me that everything is just the way it has to be. There was no mistake in the draw! After losing to Darren again I was waiting outside (I was a smoker at that time) for the bus to leave to the hotel. While the bus driver of this 30 year old bus with a damaged AC let us wait almost 3 hours in a heat of 45°C because that was the way it was scheduled, Ian Anderson was given a ride back on demand by a chauffeur in a Cadillac, just as he did all week! In Germany I learned the saying (translation): “the fish starts smelling first at the head!”. And while it is the BCA (Billiard Congress of America) not doing the right things or anything at all for the US pool scene it is the WPA not doing what it is meant for to do for the world wide pool scene. While the via smear campaign re-elected president of the WPA, Ian Anderson, jets around the world in Business and first class, nothing has been done in the past 10 years to improve the world stage for pro pool players. Not to mention that the president in a sport mainly played and promoted in the USA, Europe and Asia should not be from Australia. That just costs way too much money and is inefficient. While 5% of the players' prize money is conducted at the WPA sanctioned events the WPA itself does not guarantee any of the prize money (as it officially used to be). We even had to sign a paper right before the 2008 WC in Manila which told us that the WPA is not responsible for guaranteeing the prize money! Almost as if they would have know what's going to happen! Besides the Youth World Championships and the maintenance of the official website I can not spot what else the WPA is spending that money on except airfare tickets. Another huge failure of the WPA is the scheduling of sanctioned events. Of course it is not the WPA scheduling the events but only sanctioning them. Of course?! Why? Unfortunately the top pros of our sport are not in the lucky position like the drivers of Formula 1 cars. They fly first class to every race, their team takes care of everything else like the equipment etc., their own physiotherapist takes care of their body so they can handle the jet lag better and last but not least they earn real money! Today's top professional pool players have a tough life getting along with the little money they can win. To win money they first of all have to pay flights and hotels, they have to pay taxes and the y have to build up a “pillow” for the time after the career. How much do you think is left for the daily life?! So in my understanding it is the most obvious thing that the WPA has to overtake the responsibility of planning “the tour”. What do I mean by that? Taking a look at previous, recent and upcoming events makes clear how badly organized everything is. On one hand big events are clashing every now and then, like the Gstaad Swiss Open and the Predator Tour in Manila last September or, just last week, “the Masters” in Chesapeake/USA and the World 8-ball Championships in Fujairah. On the other hand, a European pro player for example has to travel to Valley Forge/USA in the second week of March 2011. Before March 24th he has to back in Europe to play the European Championships. Two days later the Philippine Open is calling before he can fly back to Italy just to make it on time for the Euro Tour. Five days later he should be in Dallas/USA to compete in the Ultimate 10 Ball, leaving right after the closing ceremony to make it not even on time for the Beijing Open in China. All of this in just 7 weeks! So what is the solution? I guess one obvious possibility would be to do “time and zone areas”. To be more precise, it is necessary to sanction major events on the different continents only in certain time frames. 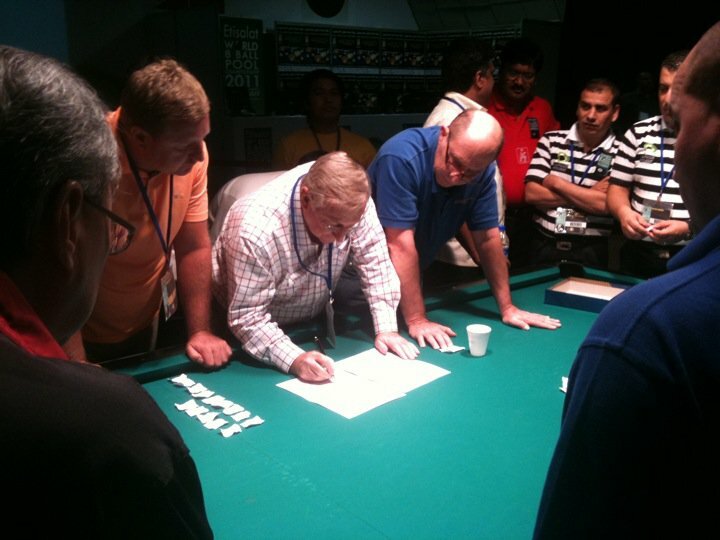 Let's say the major events in Asia are from February till April, in the USA from June till August (nearly every pool hall has AC, in contrast to Europe), in Europe from September/October till November/December. Like this the touring pros could save a ton of money on airfare, the promoters can count with more top players per event and the branding of the players and the tour would be easier: spectators have to take the chance to see the pros, otherwise they have to wait a year. But all this can only be done by the WPA as the reigning body of the world pool scene! And as long as amateur managers like Ian Anderson are leading us this will for sure not happen! If you are asking yourself if I want to appeal for the discharge of the WPA president Ian Anderson – yes I am! If we want to keep the chance to have touring pros, huge international events and to see them playing live there has a change to be done. And this change must start with “the head of the fish”! In the past few months and years we have experienced an evolution in the tournaments scene. Meant by that is the increasing number of amateur events. That was a foreseeable evolution though. Due to less and less tournaments with a decent amount of added money in the $1000s many top players suddenly showed up more and more on small weekend tournaments. They are even seen regularly at weekly tournaments, trying to collect the 50 bucks here and there. Although top players are not supposed to play these types of competitions, grabbing even those bucks, nobody can blame them for doing it. They also “need” to make some money, just as they used to before when there were many more well added events. As an expected reaction the amateur events inflated – at first for a good reason! Amateur players could finally play a tournament again with competitors of their speed or at least around their speed. They eventually could win some prize money again. Some of them took that money to buy new shoes or have a nice dinner with their beloved. Others used it to attend so called “pro events”. This was good for these events. After the number of players at these events decreased for a while there were more players again to participate which resulted in more prize money for the top players. The “food chain” was intact again. for amateur players, so they don't want to risk a pro classification by attending a pro event. The first point also indicated the circumstance that hustling is more popular than ever. But this time it isn't a gambling-thing. Players try to stay under the radar to avoid a new, maybe so called “pro status”. Why should a player show all his skills if this means less opportunity to win money? Why should a player try to improve if you get punished for getting better? Why should one try to reach excellence in our sport? This poses the question: what is a pro player? Where is the line? A common declaration is: “somebody that plays on the pro tour”, “somebody that is rank on the pro tour ranking”. But there is one important fact – there is NO pro tour. Unlike the WPBA tour, for which you have to qualify over regional tours etc., there is NO men's pro tour! Although tours like the Seminole Pro Tour contain the word “pro”, although the Euro Tour and the San Miguel Tour in Europe and Asia might be the toughest tours world wide, everybody, from your co-worker to your grandparents, from your nephew to your nurse is eligible to pay the entry-fee for these tours, play in it and can get ranked in these “pro” tour rankings. The common sense that a player ranked in any of these tours is a pro player is then obviously false. To solve this awkward situation for all involved parties either the BCA, as the governing body of the American pool scene, or a committee composed especially for this issue should determine a universal, easy to understand/use guide line. If this does not happen somewhere in the near future the USA will run out of pros as it is actually already doing. While Europe and Asia are rising and hold 95% of all world titles over the last decade there are only a few new rising stars in the US. If the country of pool's origin wants to keep pace with the international competitors something has to happen in the very near future to stop the vicious circle and the increasing gap between amateurs and pros, between the amateur and pro events!